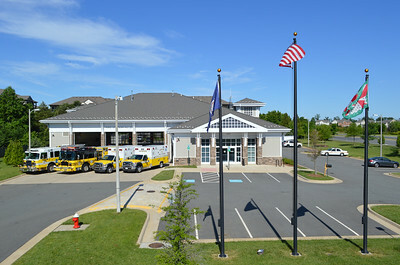 Ashburn Volunteer Fire and Rescue Department - Station 22. Nate Smith and the A Shift of Fire Station 22 organized this station photograph opportunity in May of 2015. Special help from the crew of Tower 606 who came over to Station 22 to provide a little "lift" in getting this photograph. From left to right: Engine 622B, a 2005 Spartan Gladiator/Ferrara, Engine 622, a 2014 Ferrara Ignitor, 622B, a 2008 Ford F450 4x4/Excellance, and 622, a 2010 Ford F450 4x4/Excellance. Fire Station 22 in May of 2015, courtesy of Tower 606. A different angle of Fire Station 22. Fire Station 22 - Lansdowne. 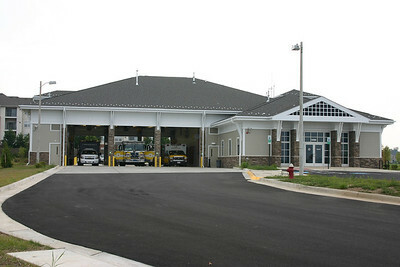 There was another Fire Station 22 in Loudoun County. Xerox (now the National Conference Center) had a fire brigade in the Lansdowne area that operated Brush 22 and Utility 22. 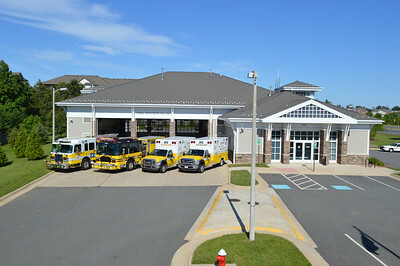 In years past, it was not unusual to have Ashburn Fire Station 6 units and Xerox operating together. Also, Mount Weather operates an unusual "Engine 22" at their facility, although it does not go off of the complex. 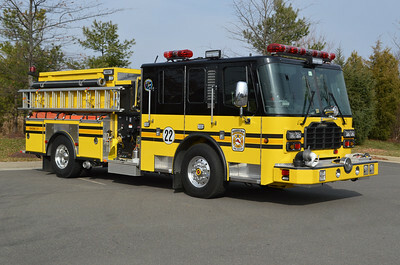 See the Mount Weather Fire Station 21 section of this Loudoun County apparatus roster. 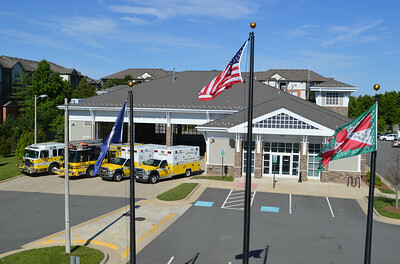 The Lansdowne Public Safety Center in Ashburn opened in August of 2009. 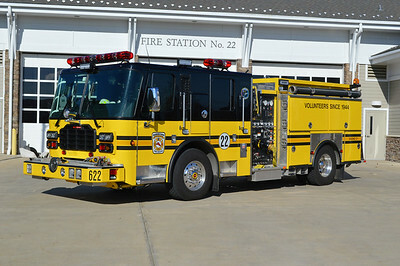 Apparatus for Fire Station 22 came from the volunteer owned apparatus that was at Fire Station 23 in Ashburn-Moorefield. Fire Station 23 became a county owned/operated facility in August of 2009, where it was once a combination volunteer/county facility. 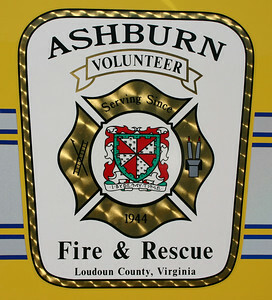 All Ashburn volunteer apparatus transferred from Station 23 to Station 22. 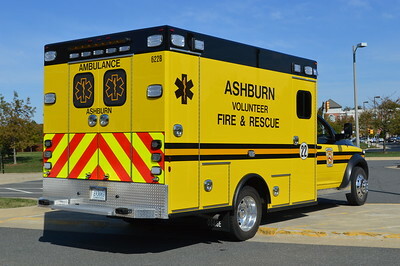 Ashburn's new Engine 622 was placed into service on December 10, 2014. This one of two identical engines ordered by Ashburn, the other running as Engine 606. The new engines are 2014 Ferrara Inferno's equipped with a 1500/500/20. 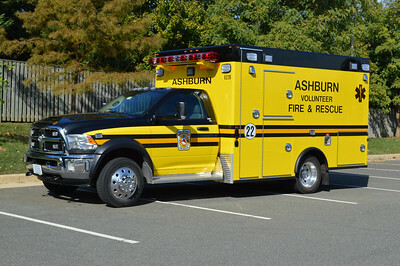 These are also the first Ashburn trucks painted in the new colors of black over yellow. Note the "Rt 7 Express" lit up in red under the Mars 888 warning light on the front cab. Station 22 is first due on busy Route 7 in the Ashburn area. 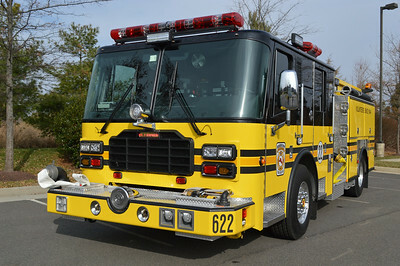 The officer side view of Ashburn's Engine 622, a 2014 Ferrara Inferno. Ashburn's Engine 622 from Lansdowne as photographed on a cold morning in March of 2015. A 2014 Ferrara Inferno 1500/500/20. One of two ordered by Ashburn. This photograph was taken as both Engine 606 and Engine 622 will be made into museum quality models by firereplicas.com. 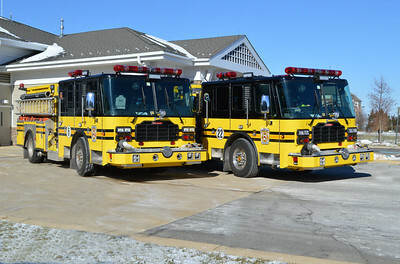 Ashburn, VA in Loudoun County runs four similar Ferrara Ignitor pumpers. Two are 2014 models, and the other two 2016 models. Each station (Station's 6 and 22) run one of each. Engine 622B is this 2016 Ferrara Ignitor equipped with a 1500/500/20 and serial number H-5974. Photographed in April of 2017 behind Fire Station 22. 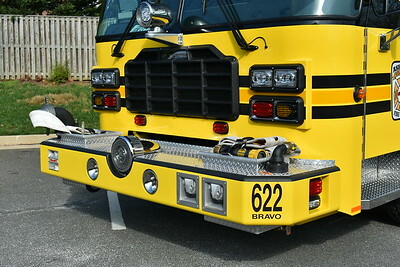 A close up of the front bumper of Ashburn's Engine 622 "Bravo", a 2016 Ferrara Ignitor. When this photograph was taken in December of 2014, Engine 622 was in service and Engine 606 was being prepared for service. Group photograph for the introduction of the firereplicas.com models. 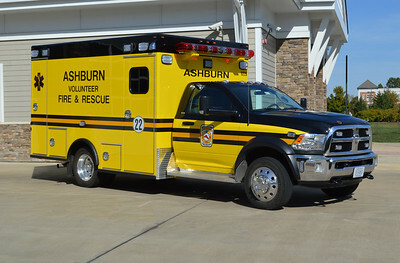 Ashburn, Virginia's "622", a 2015 Dodge Ram 4500 4x4/2017 Osage 2156 Super Warrior ambulance. 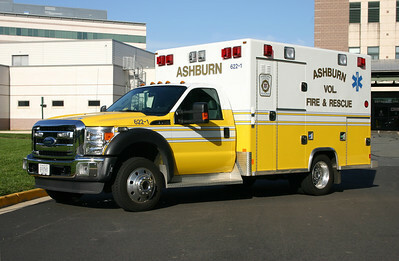 This is one of five similar ambulances running from Ashburn's two stations. The first of five Dodge 4500 4x4/Osage "Super Warrior" ambulances was received for "622B". It is a 2015 Dodge with a 2016 Osage ambulance body and was the first AVFRD ambulance to sport the new black over yellow colors. Photographed on the front ramp of Fire Station 22 in Lansdowne is "622B", a 2015 Dodge 4500 4x4/2016 Osage. 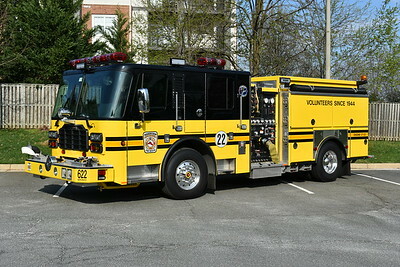 A rear view of "622B" taken in the front ramp area of Fire Station 22. 2015 Dodge 4500 4x4/2016 Osage. 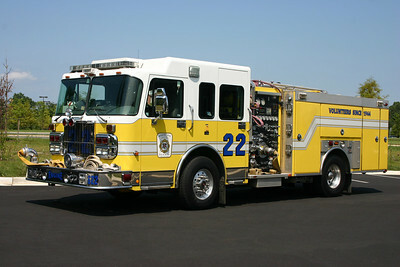 Engine 622 is a 2003 Spartan Gladiator/Ferrara 1500/500/20. 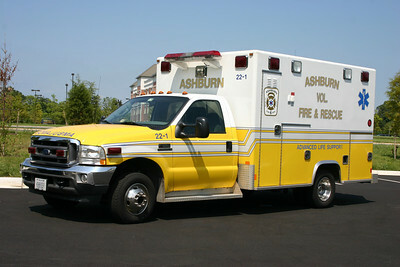 One of two 2003 models purchased by Ashburn. This was old Engine 623. 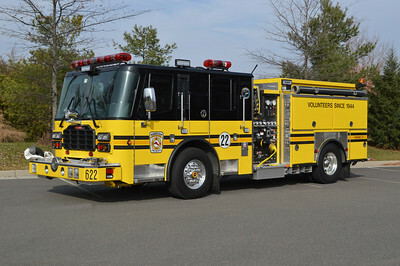 This 2003 Spartan/Ferrara was removed from service and for sale in 2014 after AVFRD took delivery of the new Engine 622, a 2014 Ferrara engine. 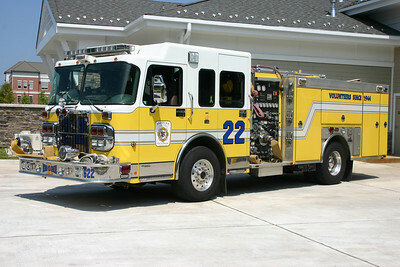 Reserve Engine 622 is also one of two purchased by Ashburn volunteers. It is a 2005 Spartan Gladiator/Ferrara 1500/500/20. It is old Reserve Engine 623. For sale in 2017. 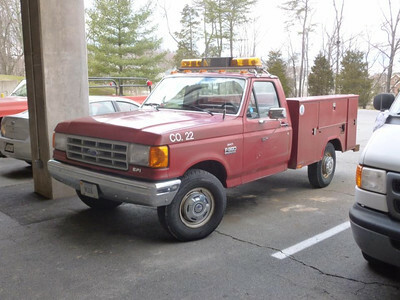 Old 22-1, a 2002 Ford F350 4x4 built by Excellance. 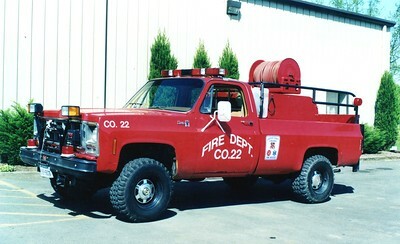 Prior to being assigned to Station 22, it ran as 23-1. In 2011, this 2002 Ford/Excellance was one of three Ashburn ambulances sold to a dealer in Indiana and now are in service in Gary, Indiana. 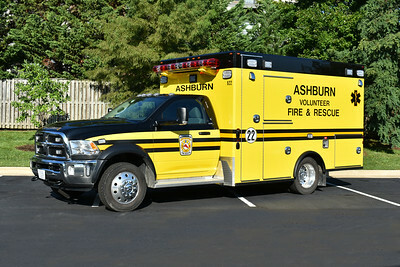 Ashburn took delivery of two 2010 Ford F450's built by Excellance and assigned one to Station 6 and the other to Station 22. Former 622-1 was photographed in October of 2011 at the Emergency Room at Lansdowne Hospital after finishing a call. 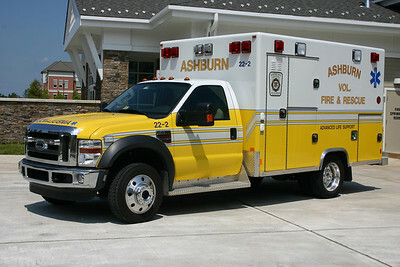 Former 622B/22-2 is one of two purchased by Ashburn and is a 2008 Ford F450 4x4/Excellance. Lansdowne Hospital is right down the street from Fire Station 22. The Xerox Corporation used to operate a fire brigade in the Ashburn/Landsdowne area. 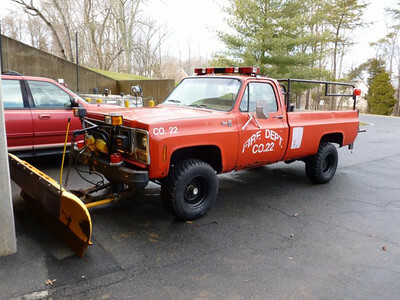 Brush 22 was a 1979 GMC Sierra 25 pick-up. This truck became a utility type vehicle when the fire brigade was shut down. Former Xerox Brush 22, now owned by Landsdowne Resort. Former Utility 22, owned by Landsdowne Resort.